My friend D. asked for a pizza dough recipe. I used the recipe below until I starting working with sourdough. But since I doubt D. has sourdough around, this will have to do. The recipe comes from Craig Claiborne’s Gourmet Diet, another cookbook belonging to my mother. When the author developed health issues, he rewrote recipes from his previous cookbooks wrote new ones for ketchup, pickles, mustard, and other staples, all without salt. If you have kids, get them involved. Make individual pizzas is a fun activity for a birthday party. 2.5 tablespoons (envelopes) yeast. Instant is fine. Place 1 cup flour, yeast, and 1/3 cup water in the food processor. Blend. Add oil, remaining flour and remaining water Blend for a minute. Dough should be sticky. You can make the dough in a mixing bowl too. Scrape the dough onto a lightly foured board and knead briefly. Gather into a ball, place in a bowl and cover with a cloth. Let stand for 30 minutes in a warm place. Divide the dough in half. Pat out each piece into a circle. Grease two 30-cm. (13-inch) pizza pans. Place one circle of dough in the center of each pan. Use your knuckles to press the dough all the way to the rim. Cover and let stand in a warm place for another 30 minutes. Preheat oven to 200 degrees Celsius (400 F.). 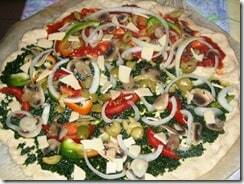 Toppings: I like to spread another layer of oil, then add fresh mushrooms, tomatoes, peppers, onions, zucchini, olives, eggplant, rosemary or oregano, and a small amount of cheese. My kids prefer plain tomato paste, onions, mushrooms, olives and cheese. Raise oven temperature to 210 or 425 F.
Bake for five minutes until browned on bottom. Notes: The raw pizza pictured above contains half spinach and half tomato sauce. Don’t be afraid of extra dough. Make it into rolls with or without leftover topping, or make an extra pizza for lunchboxes. Or freeze raw pizzas for a quick dinner. yummy. i have yet to see spinach in my store…. why is that? what is it called in ivrit? Can I double the recipe? Can I do half/half with whole wheat flour? Safranit, with sourdough I basically work with 1 kg. flour to 700 cc of liquid, about 100 cc of that is oil, and a half to one cup of sourdough. I let it rise for as long as I have time, sometimes hardly at all. Tikva: Tered. You can get frozen. I’m up to 10.5 cups of flour. Of course, there are leftovers, but not a whole lot. Crazy. Tesyaa, leftovers of pizza, muffins etc. disappear in minutes, it seems. That amount (10.5 cups) makes 7 pizzas. Only 2 of them have toppings, the rest are eaten plain (like pitas). My kids say they prefer them to pitas, but our pitas aren’t like Israeli pitas. I make my pizzas half whole wheat and it works fine. I prefer to roll out my dough on baking paper, rather than pushing it — it’s faster and easier for me, and probably more even too. And I don’t grease my pans; instead I apply extra flour to the top of the dough right before I put it in the pan. Then I flip it upside down onto the pan, so that the extra-flour side is on the bottom. I used to grease my pizza pans to keep the pizza from sticking to the pan, but I find the extra flour method works better. I also find it very easy to mix up dough by hand, rather than in a food processor (which does have to get washed, after all). Hannah, What is instant yeast? I’ve never heard the term. Ilana, that is usually my kids’ job so I don’t worry about it.. I use 90% whole wheat, which is very fine and also has 10% of the toughest fibers sifted out. Orthonomics: By instant yeast I mean the dry granules. They keep forever at room temperature, as long as they don’t get wet. Here they come in a 500-gram vacuum pack (about 1 lb.) for less than $3. It’s not as tasty as fresh yeast cakes or sourdough, and there is some kind of chemical preservative added, I believe. It doesn’t need to be “proofed” and can be mixed right in with the flour.